Our latest summer blog looks at the potential dangers of lifting and what lifting solutions Speedy provide to ensure that you have everything you need for the successful delivery of your projects. Speedy provides a complete specialist hire and supply service for lifting and materials handling. We’ll help choose the right equipment for the job, to even the most complex tasks are carried out safely and efficiently. One of the main regulations that have to be followed when conducting any lifting operation is LOLER. The team over at RoSPA pay specific interest in workplace safety and preventing accidents, you can see what the LOLER regulations are and their importance by visiting the RoSPA website. We understand when you are working on-site that the transportation of goods safely is paramount, that’s why Speedy has one of the largest lifting ranges in the hire industry, with an extensive range of material lifts, kerb and stone handlers, through to pallet trucks and stair climbers. Below are some examples of our most popular pieces of lifting equipment. 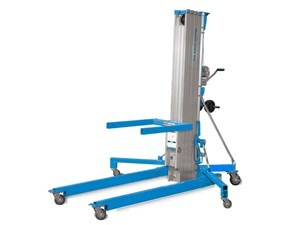 Our fleet of versatile lightweight aluminium material lifts is wide ranging, with our largest model being able to extend up to 7.42m and lift up to 295kg. Compact material lifts have multiple uses in the construction, entertainment and maintenance sectors. 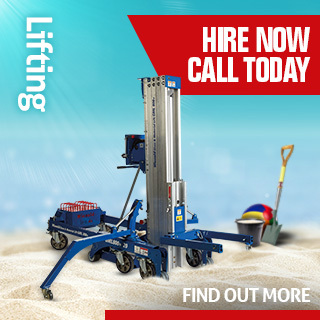 Speedy has the largest fleet of material lifts available for hire, including a range of accessories, in order to keep you lifting safely this summer. It’s important to be safe and practical when moving and carrying loads. Our pallet trucks are used in a number of different industries and are perfect for boxed and pallet loads. Designed with ergonomic handles, allowing easy movement, the robust construction and efficiency of our pallet trucks are here to meet the highest demands. 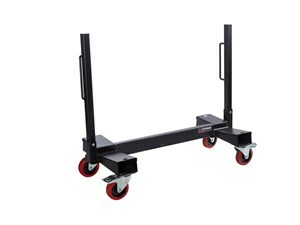 The latest in manual handling trolleys, this space-saving trolley can be used when carrying awkward products such as large sheets of plasterboard around site safely and securely.